"Hey! 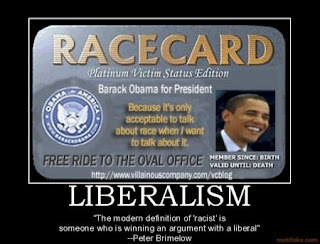 It's time to pull out the race card! The elitist 'half white' President who sides with white liberal policies, pulled school vouchers for poor black children, created 50% unemployment in the black community and supports white liberal abortion policies that kill millions of black babies every year because they're a burden to society is now NOT liked by most of the same 'typical white people' that voted him into office. Isn't that racist or something? For the first time, a CNN poll has found that a majority of Americans disapprove of President Obama’s job performance. CNN's Opinion Research surveyors were hard at work over the weekend during the final hours of the successful push to win House approval of the Senate version of Obamacare. The results of the CNN/OR survey are out and they point to the most vivid reality of the Obamacare victory - 219 House Democrats were willing to flout the clear majority of Americans on this issue. · 59% oppose the Democrats’ health care bill, while only 39% favor it. · 70% say the federal budget deficit will go up under the Democrats’ health care bill; only 12% believe it will go down. · 56% say the bill creates “too much government involvement in the nation's health care system,” 28% say about the right amount, while 16% say not enough. · 62% say they'll pay more for medical care under the Democrats’ health care bill. · 47% say they and their families will be worse off under the Democrats’ health care bill; 33% say things will be about the same, and only 19% think they’ll be better off. · 45% say seniors on Medicare will be worse off; 34% say things will be about the same, and only 20% think they’ll be better off. Numbers like those suggest the unreality of the Democrats' assumption that, as the smoke clears from the debate and people become more familiar with what's actually in the bill, they will become more favorably disposed to it in the months ahead.